Enjoy Adventures on Whispering Sands of Bromo East java, Indonesia. 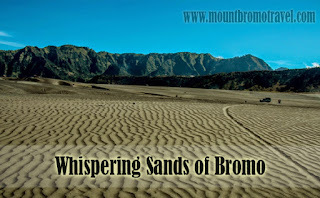 Whispering sands of Bromo is another great spot surround the mountain that should belong to your Bromo tour package. This tourism spot is a sea of sands that contain volcanic sands covering a very huge land. The dry sands are always blown by the winds so it produces some sounds like whispering. The beauty of the brown sea of sands is perfect with the blue sky that is sometimes covered by some clouds. The Location of Whispering Sands of mt. Bromo. The sea of sands is located inside the caldera of Mount Bromo. The natural and unique beauty is always taken by tourists in amazing photographs. That is why the tourism spot gets local and international visitors in the amount that is always increasing all the time. To get to the whispering sands of Bromo, most tourists ride a jeep, hardtop or another adventuring vehicle so they can pass the extreme sandy area easily. As the part of the tour package to Mount Bromo, the tourists commonly visit the sea of sands in the morning after they enjoy the sunrise beauty at dawn time. What to Do on the Sea of Sands? As the next agenda of your adventuring tour in Bromo Tengger Semeru, you certainly have some interesting activities that can be enjoyed on the spot that is like a desert. The breathtaking view on the sea of sands is certainly an amazing place for selfie or taking perfect photographic works. There are many objects that can be taken with your camera. Even many couples use this spot to make their pre-wedding photographs. The beauty of the whispering sands of Bromo also has been used as the place to take some video clip and movie scenes of Indonesian stars. For those who love adventuring with jeep, this spot is perfect to choose because of the sandy land. You can explore your favorite activity on the sands by driving the vehicle on the greatly challenging area. On the other hand, the sea of sands is also perfect for those who love cycling on the natural route. The sandy area must be more challenging and the beautiful view will be so enjoyable while cycling. Therefore, don’t forget to take this sea of sands as one of your tour package in Bromo Tengger Semeru so the great trip will not only about sunrise viewing; but more adventurous and challenging on the sandy caldera. 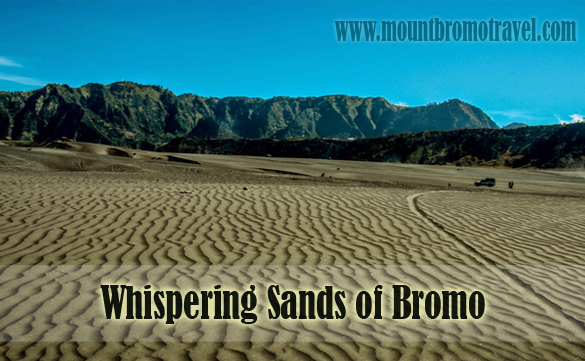 You can complete your memorable experiences by enjoying the amazing beauty of the whispering sands of Bromo.